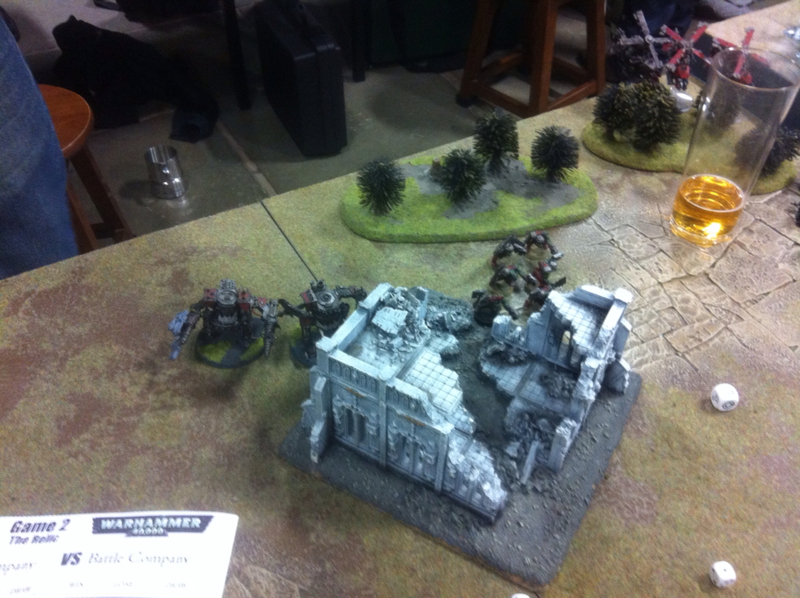 On Monday 5th November, I was in Nottingham, at Warhammer World for a National Managers Meeting. I'm he evening, we all gathered in the Gaming Hall of a School League style tournament with each of the Battle Companies forming the 'School Teams'. 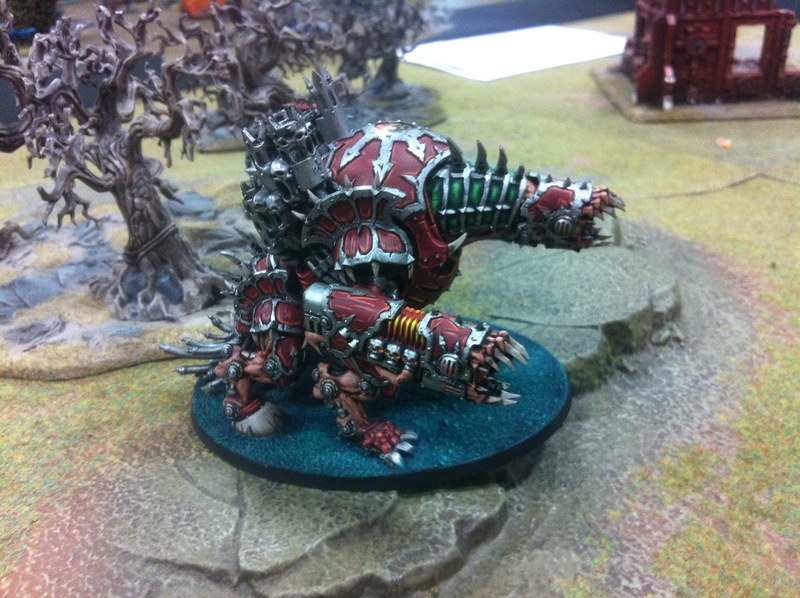 I took a Chaos Space Marine list, as discussed in a previous blog entry. 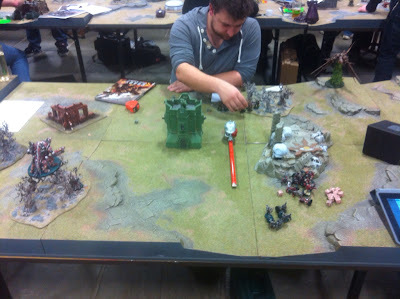 I also mentioned then that I'd post a battle report for the games played. Those reports lie below. 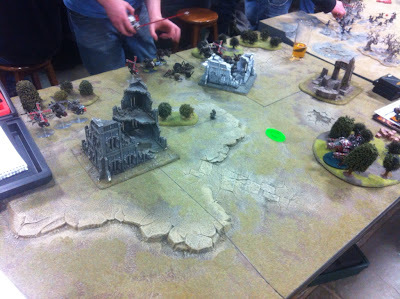 This was our board setup for the first battle. 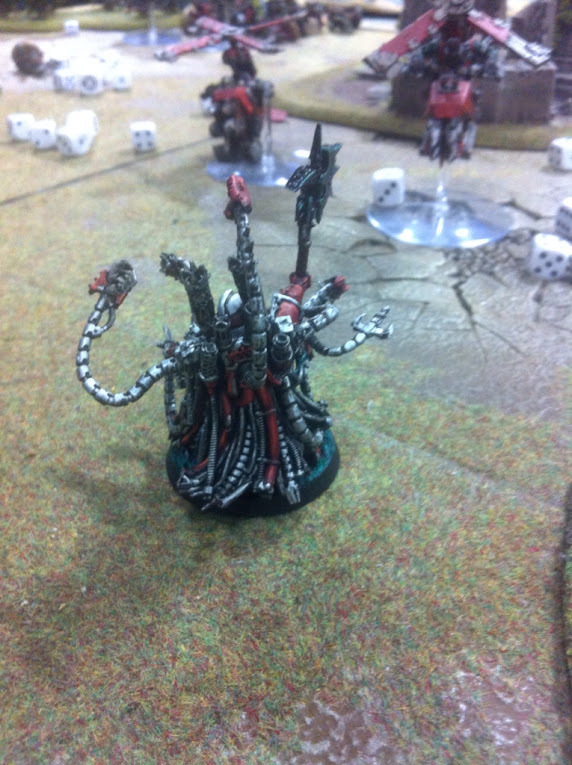 The mission listed was Purge The Alien on the standard Battleline deployment. 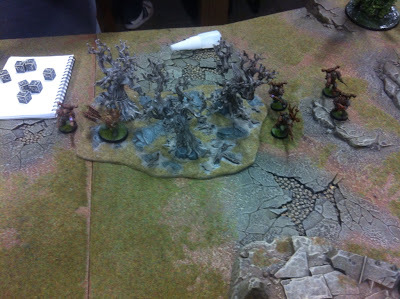 I deployed mainly central on the board with my Forgefiend and Warpsmith in the forest on the hill for a good line of sight across the whole battlefield. My opponent set up in the forest in the north east with his Heldrake in reserve, of course. My warlord trait allowed two of my units to infiltrate, so my Iron Warriors infiltrated behind the temple of skulls, middle board on the right hand side ready to pounce on the first turn. My Word Bearer unit infiltrated to the centre of the board, again, ready to rake down my opponents Death Guard on turn one. Fortunately, that's where the bad luck ended for the first turn. With some really bad difficult terrain rolls and some terrible shooting, the Death Guard were still fairly bunched up in one corner, and I'd not taken a single unsaved wound. Things went from bad to worse for him in my turn, with three VERY lucky Ectoplasma cannon shots. At the end of my first shooting phase, this was what I was looking at. That, however, is where my luck utterly ended. Whilst she Heldrake failed to turn up, the four surviving Plague Marines in the eastern squad dropped my Iron Warriors to only three models with their bolt pistols, before charging the remnants, and the Chaos Lord and single Plague Marine charged west at my Word Bearers. 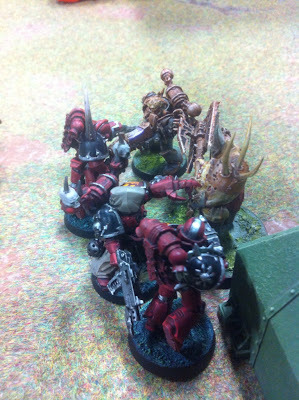 Of the ten marines I had at he start of the combat, this is what I had after my Champion hit stalemate with the plague marine champion in the first round, his lord then smacked the rest of my unit with his Black Mace, leaving minimal of my marines to flee the combat, fortunately breaking away from the onslaught. Lucky enough, I managed to rally in my turn and embark into the building, ready to man the Icarus Lascannon for when his Heldrake entered combat airspace. My Forgefiend blasted the four marines in the corner with all three ectoplasma cannons, all shots were direct hits, yet every single one of them passed their Feel No Pain saves, much to my chagrin. The next turn was utterly uneventful. 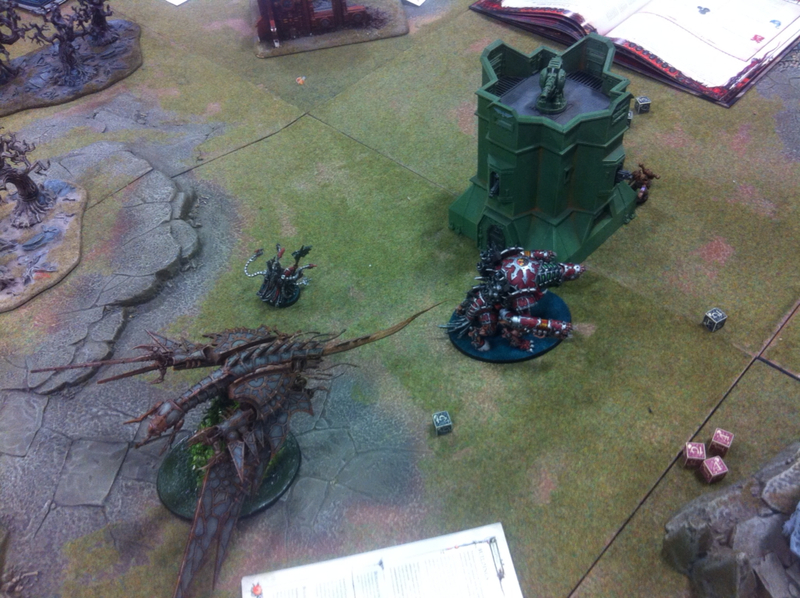 The Heldrake arrived, my Icarus Lascannon hit, but failed to even glance it. In return, the Heldrake failed to glance my Forgefiend with its Vector Strike. The Chaos Lord and his plague marine killed one of my Word Bearers when their krak grenades caused a glancing hit on the bastion, but my Word Bearers held fast. The final failed shot of the game was my Warpsmith miraculously hitting the Heldrake with his meltagun, but failing to penetrate it despite being only 2" away. Our time was up, and despite my opponent having practically no models left, I had lost a single unit of Iron Warriors, granting one kill point, first blood, and his Heldrake scored linebreaker. Thus the game ended: 3 points to nil. That Toughness 5 and Feel No Pain really caused me issues. The high toughness meaning bolters wounded on 5s, and the Feel No Pain keeping them alive through an Ectoplasma barrage has earned those Plague Marines a lot of respect from me. 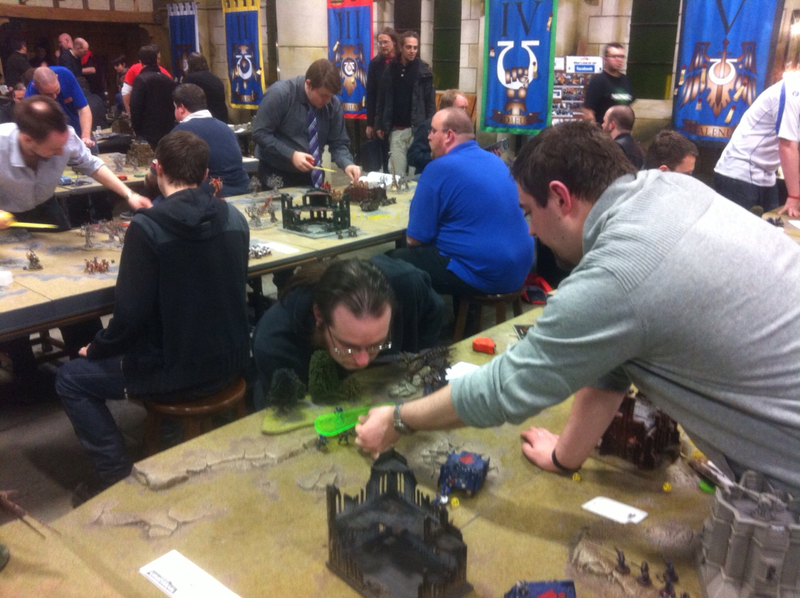 My second opponent for the night was an ork player. I was up against two units of boyz, a Warboss, two units of 3 deffkoptas, and some killa kans. Ork hunting is one of my strong points, a lot of my friends having played greenskins, so I must say I was quietly confident. The game was 'The Relic', again with a Battleline deployment type. This time, my opponent, Nathan, won the roll off and deployed first. Each unit of Deffkoptas deployed on the flanks, with both blocks of boyz setting up in the ruins with the Warboss shacked up somewhere in the middle of them all to goad them forwards. Again, my Warpsmith and Forgefiend deployed in a forest, which turned out to be an Ironwood (score!) and my Warlord Trait again turned out to allow both my troop units to infiltrate. 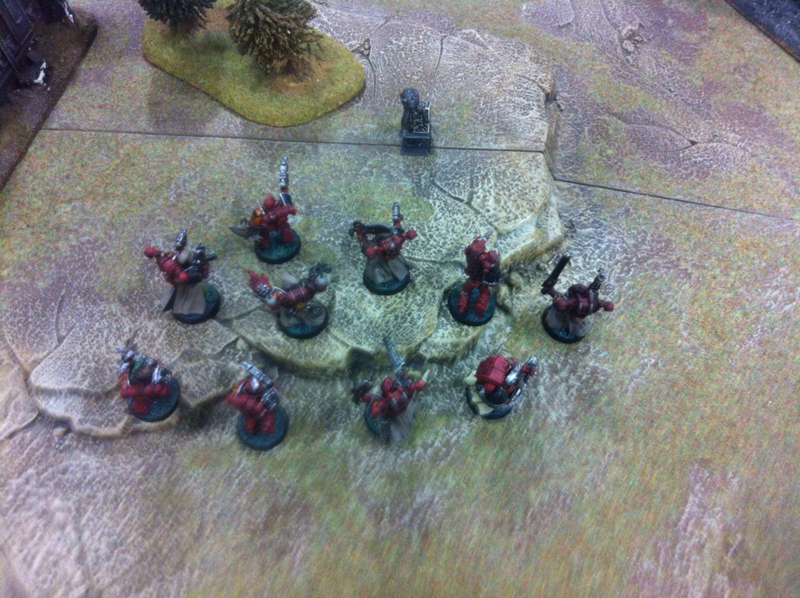 My Word Bearers took up position immediately in front of the relic, able to grab it on turn one. 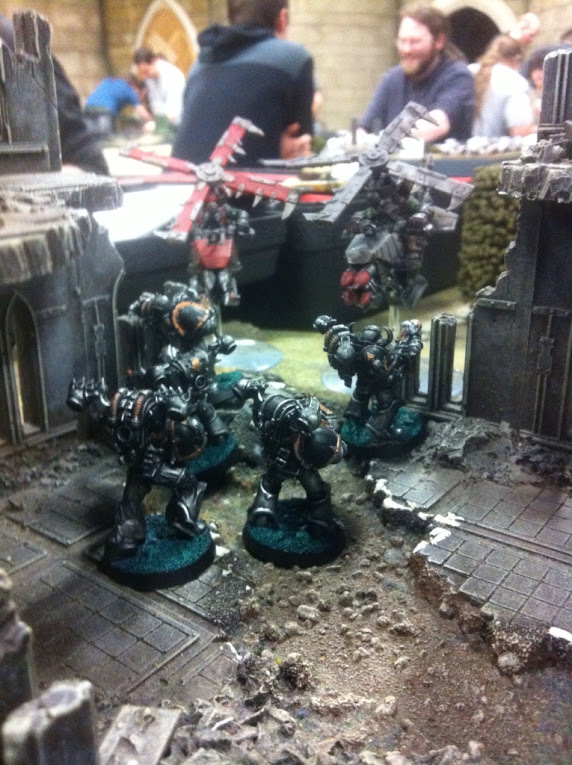 My Iron Warriors slinking their way into the ruined building at the top of the hill. 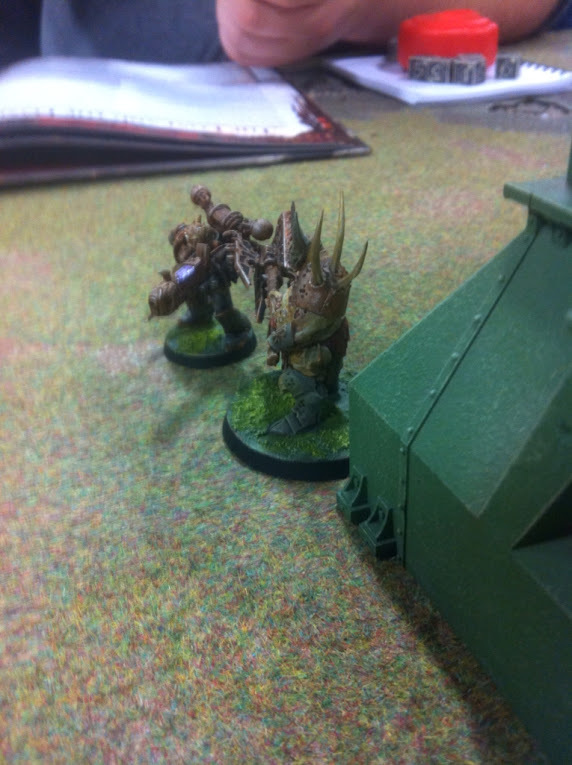 My Warpsmith also made sure to smash the defences of the ruin the ork boyz had taken cover in. Amazingly, I managed to seize the initiative, and my Word Bearers claimed the relic right off the bat. My Iron Warriors crept through the ruins and proceeded to tear a deffkopta out of the skies with mass reactive bolter shells (the meltagun missing, as is tradition). My Forgefiend made a devastating bombardment on the units of Ork boyz, slaying the Warboss, wiping out one of the units utterly, the second unit holding on with six boyz remaining. 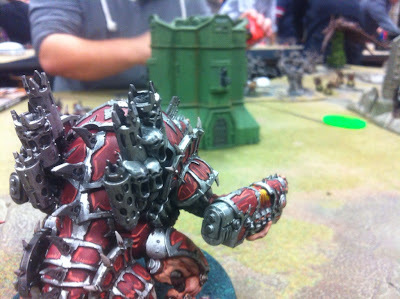 The killa kans made a miraculous 12" charge into the Word Bearer unit, who promptly grenaded them both to scrap before the walkers could even raise a buzz saw. 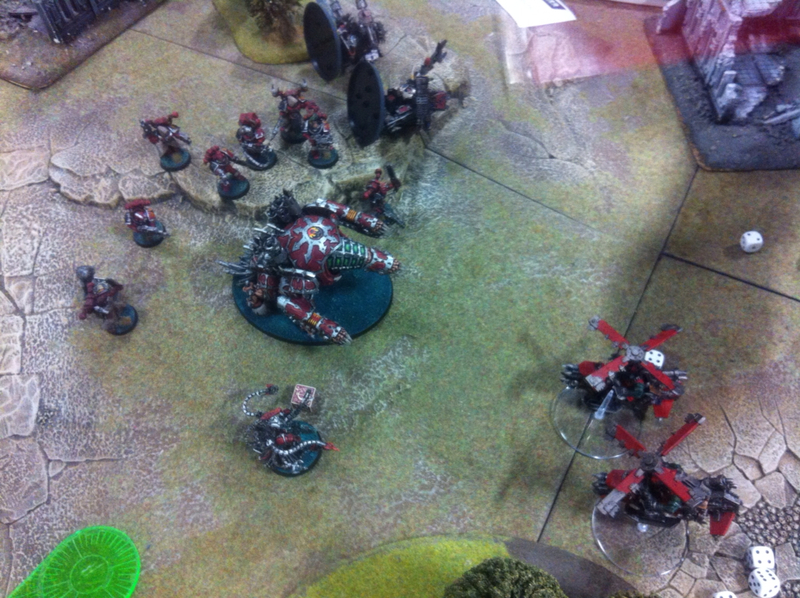 As repercussion, the deffkoptas on the eastern flank zoomed across the board and proceeded to launch a barrage of rokkits into the Forgefiend, all three penetrating. 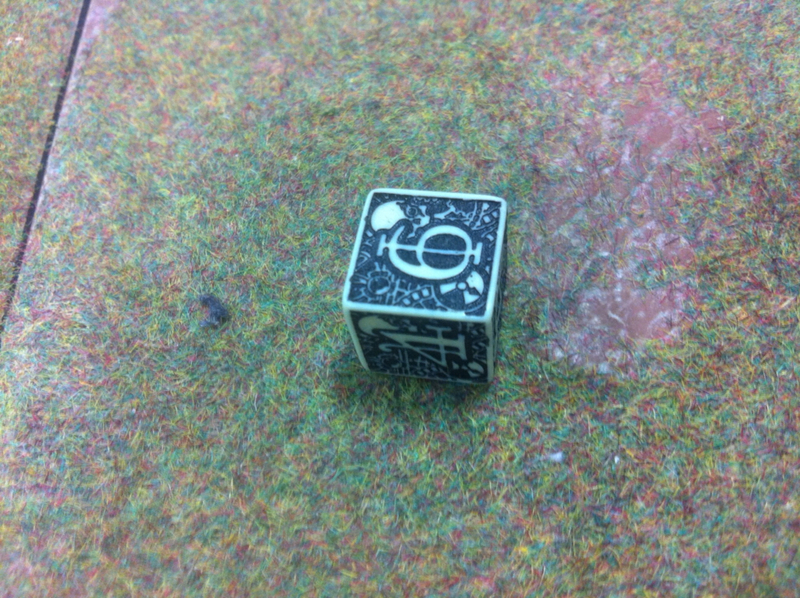 Two hits were shrugged off by its demonic invulnerable save, the third however rolling a lucky six and blowing its casing wide open in an explosion as the daemon within broke free of its prison. The final turns consisted mostly of a mop up effort from my forces, finishing off the two deffkopta units and taking minor casualties in return. With less than 30 seconds of game time remaining, the Warpsmith fired the flamer and meltagun from his Mechatendrils, blasting away the last two deffkoptas as the clock rolled to zero. Those last six Orks, however, holed up in the northern ruins held annihilation at bay. The score: first blood, slay the warlord and the relic to me, for five points to nil. Ultimately, as I stated in the run-up blog, I wasn't intending the list I took to be competitive, and was relatively surprised as I glanced around the room at the other armies on display that most of the others had taken this same approach. We were all here for some fun games using the models we liked, not whatever was tearing up the tournament scene (despite one tau player launching his ethereal off a Fortress of Redemption fortification on turn 1, purposefully sacrificing him in the style of Denethor to grant his entire army Preferred Enemy). The point of my list, in both its background and execution, had been to field-test the Forgefiend, and in true Warpsmith style, I took field notes. My worries beforehand had been that Ectoplasma cannons have the Gets Hot! special rule, and statistical probability that this would happen once every two turns. In practice of course, it's occurrence can be more or less common than this, but never really posed an issue. When a vehicle gets hot, it takes a glancing hit if it further rolls a 1-3, to which the Forgefiend then gets a 5+ invulnerable save. Assuming even this is failed, the Forgefiend has It Will Not Die allowing it to recover any lost hull points. Also, I discovered that Armour 12, coupled with the 5+ invulnerable, is fairly durable, and, again, having the Warpsmith and It Will Not Die really means it will only be destroyed to sustained heavy firepower. All in all, I was very impressed with the Forgefiend and would heartily report it's field tests successful. This combined with it being one of my favourite new models means it has found a fairly permanent place in my lists! ...Oh, and by the way... Tenth Company won overall!